Messenger photo by Britt Kudla Aaron Graves of Southeast Valley grabs Estherville Lincoln Central player Briar Rowley for a loss last week in Gowrie. GOWRIE — Mark Graves has been coaching football for 24 years, so when fall rolls around, spending quality time around his family has always been a hit-and-miss proposition. Graves and his wife, Amber, have five children: four boys and a girl. All four boys inherited their father’s passion for football, and these days, they’ve been able to parlay that love into quality time spent together. Emma is a sophomore at Iowa Central, while youngest son Nate is in sixth grade. Twins J.J. and Zach are seniors at Southeast Valley and Aaron is a freshman. For the past seven seasons, Graves was on Kevin Twait’s staff at Iowa Central Community College, coaching the defensive line for four years and the tight ends and fullbacks for three. Now, Mark’s priorities are closer to home. “It’s been a really fun (change of pace) for me,” Graves said. “I’ve coached this senior group since they were in eighth grade. When I was at Iowa Central, I didn’t see them play a lot (during the regular season in high school), but now I get the chance to bond with them. After Twait’s retirement, Graves returned to the prep ranks to help his boys learn the game of football for the Jaguars. All three Graves boys are currently two-way starters for Southeast Valley. J.J. and Zach are middle linebackers and Aaron plays defensive end. On offense, J.J. is a left tackle and Aaron is the left guard. Zach lines up at wide receiver. “I couldn’t care less if they were good at sports,” Graves said. “I just want them to be good people and hard workers. You’re not always going to be the best or most skilled, but you can be the hardest worker and a great leader. Making up one-fourth of the defense, the Graves have been a solid force for the 6-2 and seventh-ranked (Class 2A) Jaguars, combining for 104 tackles. 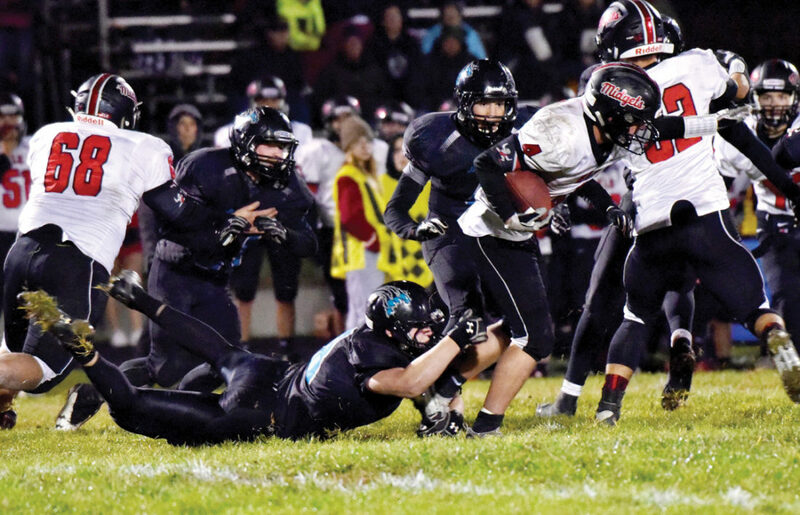 “Anytime, you have coaches’ kids, you know you’re going to get kids that have knowledge of the game,” said Southeast Valley head coach Mike Swieter. “They grew up around the game. Mark has coached at every level, so he has great knowledge of the game. J.J. is second on the team in tackles with 40, including two for loss and one sack. J.J. also has an interception, and Aaron has two fumble recoveries. The trio has combined for 104 tackles. On offense, Zach has four catches for 37 yards and a touchdown. Aaron has 11 tackles for loss and eight sacks. Zach has 24.5 tackles and one for a loss. Despite being just a ninth grader, Aaron is 6-feet, 4-inches tall and 225 pounds. Aaron’s eight sacks rank second in 2A and fifth in the state. “He’s always been a coach’s dream,” Mark said of Aaron. “He is mentally and physically strong. Wherever he is, in the weight room or P.E. class, he always works hard. The trio enjoys a strong bond together under the watchful eye of Mark.